His interest in organ music and construction of the instrument began early in his childhood. Music instantly became a passion of his life, which later evolved into his choice of profession: being an organist and teacher. He is a graduate of the Academy of Music in Łódź, in the organ class of professor Mirosław Pietkiewicz, and has participated in many seminars and consultations. Throughout his childhood he was fascinated with issues associated with electricity, electronics, physics and computers. On his own, and with his father's support, he developed skills and knowledge in all these areas. He learned to write simple programs when he was only a few years old, thanks to access to the physics lab at the Technical University of Łódź, which gave the base for further development. These interests and passions have finally merged into a dissertation on the history and future of organ building and tracker action. The dissertation went further into use of innovation-enabled electronics and computers. As a part of the dissertation project, Mr. Mońko designed and built a prototype of the key-action supporting device. His dissertation was given the highest score possible. Mr. Tomasz Mońko performs concerts which concentrate on the Baroque repertoire and which feature his own modern organ improvisations. He has also served as a lecturer of liturgical accompaniment and organ improvisation at the Academy of Music in Łódź. Through the years, he has been filling orders for design, construction and programming contracts of various digital devices and more complex electronic systems. In 2010, he and Tomasz Uliński formed a company named T2Logic, to create innovative solutions for and refinement of existing instruments. One of the first projects from this partnership is OrgNG, which is a comprehensive control system for pipe organs and includes new generation combination memory, as well as a MIDI encoder and decoder, and energy-efficient power driver. Under the name of "T2Logic" company they work together on creating innovative solutions and the refinement of existing organs. 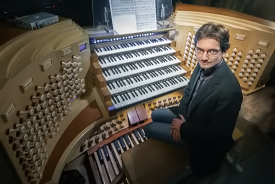 In 2016, in one of the churches of Gdynia, they created the first system in Poland which provides wireless connection of two pipe organs and two separate consoles. Programming (MCMS v1.3) & design: Tomasz Mońko; Visits: 192350 [B]. Copying allowed with written permission of the author. ©Tomasz Mońko 2014.